I'd like to use the Lato font here, please. If you don't have that, try "Lucida Grande" next. If you don't have that, try Tahoma. So in what situation would a browser not have the font you're asking for? That's pretty common. There are only a handful of fonts that are considered "web safe"—meaning that it's likely most computers visiting your site have that font installed and so the browser can use it. Think: Arial, Times New Roman, Courier, Georgia, Verdana, and a handful of others. 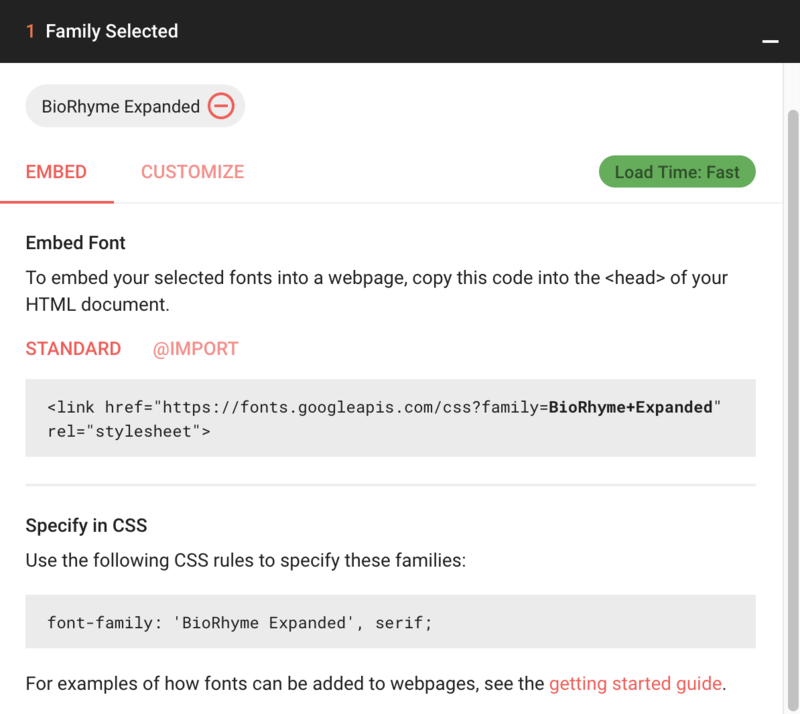 Load this font first, then you can use it in CSS. Even when you load a font in this way, it's still possible that the font doesn't load. While Google is a generally very reliable host, you don't control their servers; they do. Even more commonly, poor network connections may prevent a font from loading. In any font loading failure scenario, that's another situation where a fallback font stack comes in handy. A fallback font, in this case Impact, is seen. It's incredibly awkward and doesn't match the desired look at all. Better to have your font fall back to something close to your top choice than to something totally unrelated! There is a fantastic tool by Monica Dinculescu call Font style matcher where you can play with fallbacks (that's how I made that GIF above). 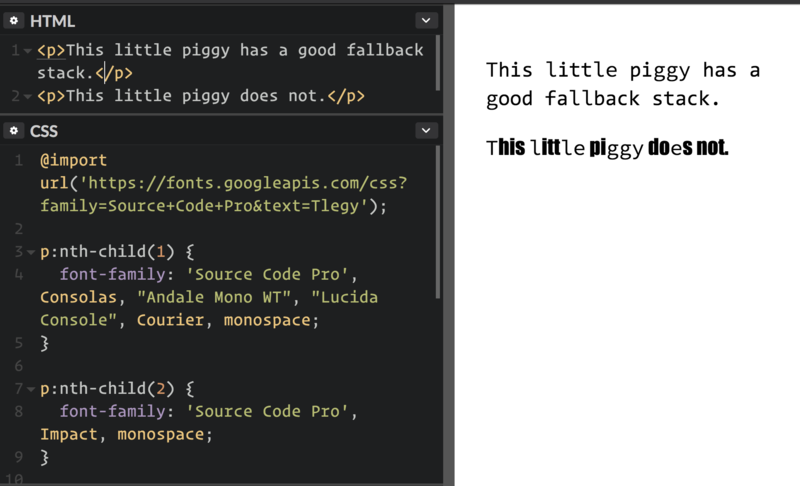 In the example above, we can see that Georgia is a much nicer fallback font than Impact is! The example is a little bit more fancy than just changing the font though. A couple of other settings were changed to make them match as closely as they are. To take advantage of that, you're in font loading territory, which gets a bit complex. Your best bet there is consulting Zach Leatherman's A Comprehensive Guide to Font Loading. In any case, picking a nice fallback font alone is worth doing. An interesting note about fallback fonts is that it's not all-or-nothing. Individual characters in a font can fall down the stack if the specified font doesn't have that character available. As an extreme example, I'll load the custom font Source Code Pro from Google Fonts but I'll force it to only contain a handful of letters. You can see in the first sentence how the fallback fonts took over and the end result wasn't disastrous (like the second sentence) even though the custom font didn't have some of the characters available. This will be more likely to happen with things like uncommon ASCII characters or even accented characters like ü, ā, or ñ. See the Pen Ransom Note With Google Font Subsets by Heydon (@heydon) on CodePen. These “CSS Basics” series articles are nice for learning and for refreshing. Lots of really nice bits of information, good idea and good stuff Chris. I would maybe suggest adding a TAG for “CSS Basics” for each of these articles and pages though. Realize this is titled fallback fonts, but wanted to share that using a font stack in reverse can provide many benefits as well. Using a stack relying on resources the user mostly has in their environment saves a lot of overhead for the user and experience.